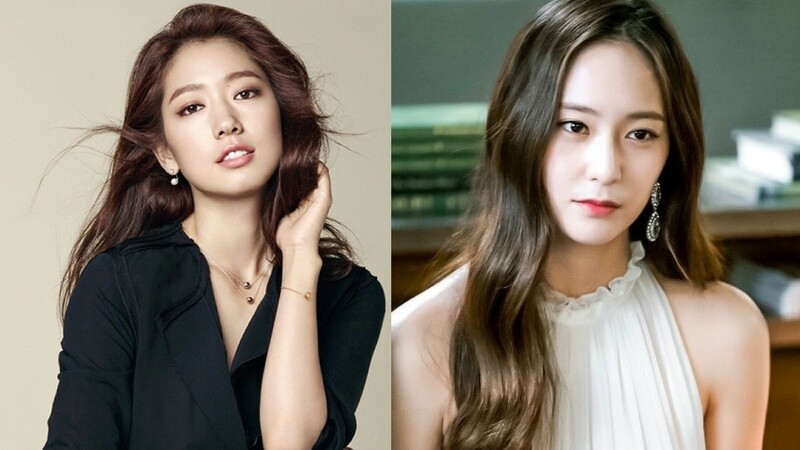 Park Shin Hye thanked f(x)'s Krystal for sending a coffee cart to the set of tvN's 'Memories of the Alhambra'. SEE ALSO: [Interview] Ask anything and everything: Let us know your questions for IN2IT! On August 2, Park Shin Hye posted the photo below on Instagram with the message, "The most beautiful Soo Jung, thank you for the coffee cart. Because of you, we had a refreshing filming despite the 40C weather. World angel my love <3 Hahaha. Be happy." In the image below, you can see the coffee cart has banners that say, "Because our pretty Shin Hye unnie shouldn't get hot <3 Only Shin Hye unni for Soo Jung." Park Shin Hye got a gift from her friend and former co-star Krystal of f(x)! Park Shin Hye is currently filming the upcoming drama “Memories of the Alhambra,” and on August 2 she shared a photo of herself on Instagram enjoying a cool drink in front of a coffee truck on set. 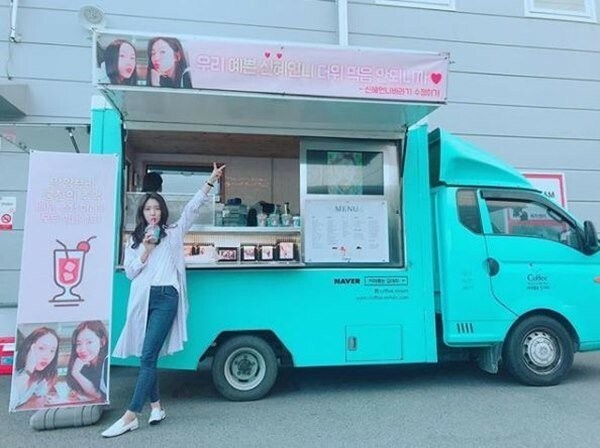 The banner on the truck includes a photo of Park Shin Hye and Krystal with the caption, “Because our beautiful Shin Hye shouldn’t get too hot,” and a message cheering on the cast and crew of the drama. “Memories of the Alhambra” also stars Hyun Bin, Han Bo Reum, EXO’s Chanyeol, and more, and is slated to air in November. Ah, man, it doesn't air until November? I feel like I've been waiting a long time to see this one. I like the cast and I like the writer. All the locations sound so interesting, too! Can't wait to see the result. @rori0711 : It made my day, dear friend! Hats off to the fans who captured them together at Incheon, Seoul! They look absolutely fantastic in one frame...interacting as well! November wait now feels extremely long ....nearly 4 months still ! Wow can't wait to see Memories of Alhambra. November seem to take forever. I really miss seeing Hyun Bin in drama and this will be my second time watching Park Shine Hye. Hopefully this drama will hit big for both. They look very cute together although the shot is not clear. That laugh from Hyun Bin sure brighten my day. 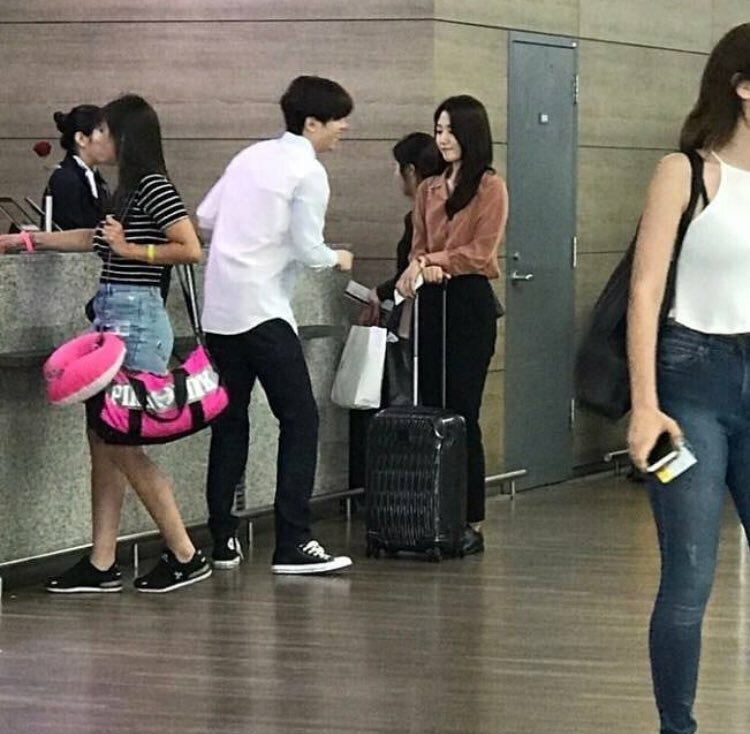 Park Shine Hye look shy there... . Love the chemistry already. The upcoming drama I'm most looking forward to! I never thought of the Hyun Bin/Park Shin Hye pairing but it sounds fun. I like them both. And this writer is just great, propably the kdrama writer with most unique plots of them all. I'm a bit confused though because it seems the story changed? Now just a travel story or? No Augmented Reality component anymore? Or it's still there but they simply changed the synopsis to keep that part more of a mystery? Cause there are still games and programners mentioned. Someone explain please?? I really liked the idea of AR themed drama, I hope they didnt completely remove that part! Why is PSH so shy lol? Overwhelmed to be working with a big name like HB? When did filming start? Maybe she hasnt gotten comfortable with him yet cause not enough filming together yet. PSH fans is she always shy at 1st with costars? @intrariver If there is one thing I've noticed about kdramas, it's that Korea knows how to write killer stories, but they are clueless about synopses. I think the summary for SJJ's last drama was something like, a man and a woman in their 30s fall in love. The woman is a surgeon. Um...we're talking W here. There was a LOT more plot that that!! So I am not too fussed about the summary. She wrote W, QIHM, Nine... SOMETHING interesting will happen in this drama. Speaking of, I'm looking forward to seeing PSH and Hyun Bin, yes, of course, but it made me smile to hear that Kim Eui Sung will make an appearance in this one, too. Hopefully for his sake he is saner in this one...or at least has learned to lay off the drawing a bit. you are right about a number of conjectures floating around about the plot ...AR being one of the earliest one. I feel that we most probably will see it in the drama. It’s based on two things...fighting scenes were filmed in Alhambra involving warriors from past and secondly there are a few number of characters with video games background and expertise. in regards to the pic at Incheon...it seems that it’s not HB with SH. The drama starts November 19 and ends Jan 8 "..
nice play there by Lee Hakjoo blindsiding us he doesnt look bad on a lighter note. Thanks so much for explaining/reasurring me about AR element! Oh so its not even HB in that pic . Ahahha then it really doesnt matter that PSH is being shy to a random person. Oh and please don't misunderstand me. I'm annoyed over too many people claiming PSH can't act etc., when that's not the case. Please don't think I'm among those annoying PSH naysayers. The girl has a charisma than can make any role shine. Can't say that of some other actors. She even works well with very much older actors. Compare her acting out an innocent nun that became great despite role kind of weak character vs some other actresses who would've ruined thar character because lack of charms (won't mention any names to prevent annoying people/fans of those other actresses). I have faith in HB&PSH, that's what I' afraid of actually. I'm trying to be sceptical on purpose of ANY possible thing so that I won't build up my expections skyhigh for this drama ha ha. That's why I also doubted changed plot/synopsis, I'm trying to not expect too much from a drama that seems to have it all. Everything about it sounds so amazing I'm afraid this is too good to be true. I did that with Goblin only to not end up liking it. Lesson learned. It's better to not allow oneself to get too excited in advance, that will spell a disaster. Now since everything looks perfect so far let's hope execution is great as well. Once this starts airing and IF it turns out just as great as it seems only THEN can I allow myself to get fully excited. Venture capitalist Yoo Jin Woo (Hyun Bin) travels to Granada, Spain, and spends a night in an old hostel run by Jung Hee Joo (Park Shin Hye). @intrariver : No worries! You are welcome! I am not sure about the plot except what’s there for all to see. Everything from the story to BTS pics or rather any pic has been kept totally secret by the production team. What little we see is from the very enterprising fans and admirers of Shinhye and HB. i actually prefer not knowing the plot. But, pic of the OTP once a while wouldn’t be bad. It’s good to see you like SH too. She is definitely not shy! Never has been except when enacting a scene. She is also not overwhelmed in any situation or by anyone no matter how big a celebrity since she has been in the Entertainment industry from a very young age. She herself is a big Hallyu and global star in her own right. Just wanted to set that straight for those who don’t know about her. @lduc : just wanted to say thanks for keeping us updated at the earliest with the latest news about the drama and related matter.